both games were long and nerve braking. The Epirotes both times pushed the Roman center to the ropes and finished with the slightest of margins. Both games could have resulted as 6:5 for Romans too, but the Epirotes both times won. Thanks to Andygor for being such a nice opponent. Looking forward to play with him in upcoming tournaments. We do not count blocks for the Open rounds. That is for the MT and finals. Very nice game. There was some friction on the flanks and than a risky cavalry attack cost Rome one of its cavalry. 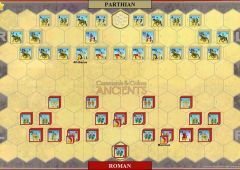 Unfortunately there were no command center cards to recuperate and a series of vicious attacks from the elephants and the phalanx won the day for Pyrrus. He preserved his elite troops while defeating the romans and continued on his march towards Rome. 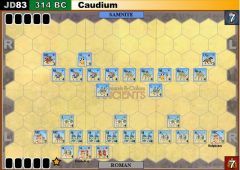 I don't know what you have against light troops, but the Roman command decided that day that the epirots must be dealt with by the velites. 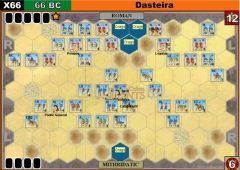 4 cards is not enough, and my orders were as on selection: 2 move-fire-move, 3 light troops, darkening the sky with arrows. The Legionnaires had the match close, and was killed by the phalanx. Seriously, seeing these cards, I decided to play as aggressively my light troops as possible easy. The enemy fell for it and even first lost his cavalry. But then he came to his senses and led the infantry line forward. 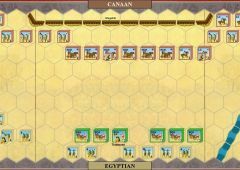 I had to play Order Mounted to the two horse groups (one, however, was in the back) to arrange adventure, but attack on elephants wasn't successful, “First Strike” stopped cavalry. Blue Troops cards and Order 4 unit in the center, the only thing that was per game at the infantry centre, I ordered is so-so. Bad management of hand. 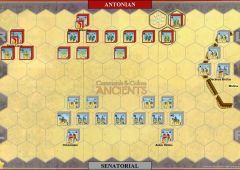 He leaned forward, there was no continue, and Pyrrhus was approaching... And legionary only move back. Then the legionaries stood, and died, almost without reaction. 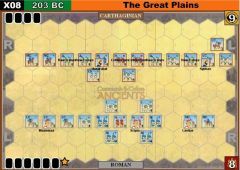 The activity of my light troops had no effect on the Enemy of Spartacus, from which activated 6 units and Inspirational leadership who completed the rout of the centre. 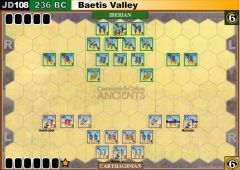 However, eventually the Roman army was blown away when I lost the first squad velitov. Second velits, undergoing the whole fight on his feet, kept 1 block and even sheltered the lider from beaten triarii. 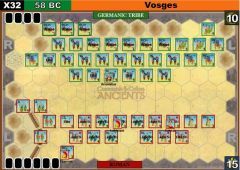 Seeing that the trump of Rome did not play, the remnants of the army turned into a friendly General rout. Last edit: 2 weeks 4 days ago by TTK. 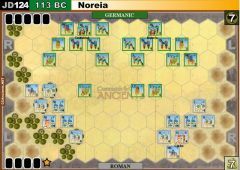 The Roman light units were the heroes of this battle, as they first blunted attacks by the Greek cavalry then heavy infantry, before leading a counterattack that opened holes in the Greek lines that allowed the Roman heavy/medium infantry to surge through. 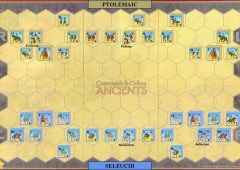 The Greeks were very aggressive, and nearly broke the Roman right, but in the end, the Roman dice and Spartacus card were too much. 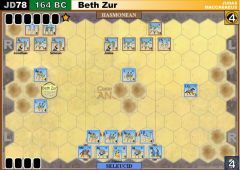 Clearly, whatever Pyrrhus decided to sacrifice to Tyche on the battlefield before this clash was the correct choice. In particular, the elephant corps drew inspiration, because not only did Tyche grant the Greeks two mounted charge cards, but also empowered the elephants as her personal weapon of vengeance on this day. 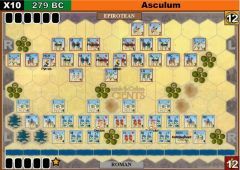 After a well-executed Roman advance on the Epirote lines trapped an LB unit and vaporized a M with no battle back, the Greeks were able to luckily eliminate the Roman leader and just barely reform the infantry into some semblance of order. It was then that the elephants struck. In the ensuing chaos of two consecutive MC cards, the oft-maligned pachyderms (in particular, maligned by me because I never use them correctly it seems before today...) were responsible for eliminating 3 Roman MI units. On the other side of the battle, the Greek MC and LC were able to chase down and isolate the Roman MC to gain the 6th banner. Last edit: 2 weeks 2 days ago by taliapharaoh. Pulling a 6:0 victory with the Romans in this scenario is astonishing achievement. Congratulations!